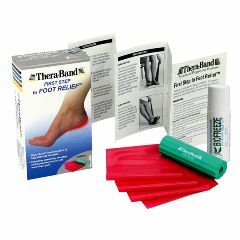 AllegroMedical.com presents The Thera-Band First Step to Foot Relief Finally, A Practical Solution for Heel Pain. The Thera-Band® First Step to Foot Relief™ is an at-home treatment solution for patients with heel pain. This complements the patient’s in-office treatment with tools used at home to help relieve foot pain. Thera-Band Foot Roller provides massage and cold therapy (when chilled) . Biofreeze® Roll-On provides temporary relief of foot pain. The roller ball allows a massage-like application directly to the plantar fascia. Instruction Insert with step-by-step instructions to guide patient through at-home treatment plan.